Here's an excerpt from Chapter 16 (Move Beyond the Past) . Here are great comments about Just Get Serious from Al Wiseman, DTM. 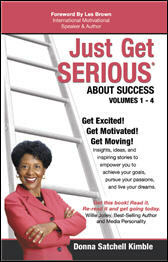 "Donna reveals how to strengthen your self-belief, make serious progress, and create a solid foundation for success." "A valuable and illuminating book! Feeling there may be more to life than what you are currently experiences? If so, this is a 'msut read' book". "This is a must for those wanting to be more successful at the workplace and in business. Donna's ideas are relevant, timely, and thought-provoking. Add this book to your personal library. Then read it often to experience progress and results on your road to success."